Suburban, from the best-selling family of full-size SUVs, offers best in-class highway fuel economy of 23 MPG, along with the power and capability your family needs. Suburban features a powerful 5.3L EcoTec3 V8 with the perfect combination of performance and fuel economy, offering efficiency without compromising power and towing capability. A light weight suspension helps optimize fuel economy, offering 23 MPG highway while still being stiff enough to maintain the excellent ride Suburban is known for. Along with a superior ride, Suburban offers a maximum towing capability of up to 8,300 lbs.– plenty of power to tow boats, ATVs and whatever else you want to bring along. 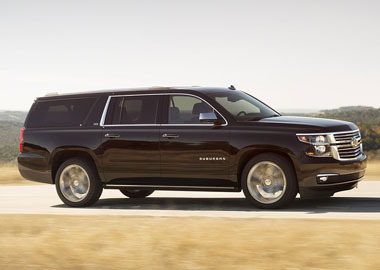 Suburban was designed to make an impression. A sculpted and athletic exterior gives this large SUV a commanding presence. 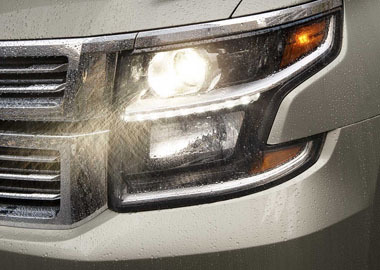 Suburban LTZ features standard HID headlamps and LED daytime running lamps. 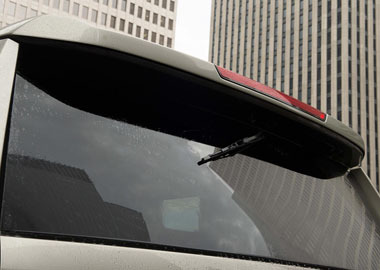 Suburban features a hidden wiper that is tucked under the rear spoiler at the roofline. Available power-release second-row and power fold-flat third-row seats – the fastest of any competitor – give Suburban a versatile interior that’s ready for anything. Inside, Suburban features enter console large enough to fit a laptop computer as well as door storage with room for water bottles, umbrellas and other small items. Simplify your life with ingenious technology like support for Apple CarPlay™, a smarter way to use your iPhone with the Chevrolet MyLink display. And available built-in 4G LTE Wi-Fi® helps keep your family connected and entertained while you’re on the road, while the new available 8-inch Reconfigurable Cluster with Driver Information Center and Head-Up Display provide easy access to all the information you need for the drive.